Our Shelco 10 Micron Cleanable Filter System Ends the Need to Buy Replacement Elements Which Saves Money! Shelco 10 Micron Stainless Steel Cleanable Filter System with 3/4" Ports and Heavy Duty Mounting Bracket. $259.00 + $30.00 Shipping. Call 1-605-881-3473 to order. 1" Aluminum Trigger Nozzle $50.00 + $10.00 Shipping. Works With All MP2000/3000/4000 Series Pumps. Call 1-605-881-3473 to order. 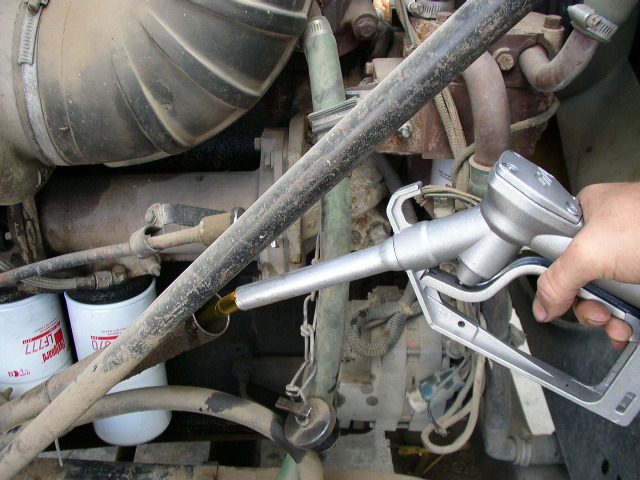 Our cast aluminum manual trigger nozzle works great for controlling the oil or diesel flow through the outlet hose. Our MP2000, MP3000, and MP4000 series pumps are equipped with internal pressure relief systems which allow the user to throttle the flow of fluid through the nozzle. It is similar to the ones used in gas stations but the flow is controlled manually. This is a manual nozzle without an automatic shut off. Just squeeze the trigger to dispense the oil and let it go to stop the flow. Our pumps run in bypass when the trigger is closed. We supply the 1" barb to hook the hose to the nozzle. If you get a hose kit, we install a male quick coupler. This nozzle is great for reaching those oil filler holes that are in tight spaces. No need for a funnel when you have one of these to pump the oil in! When using this nozzle with our pumps, you can put the oil where you need it and dispense just what you need. And you can regulate how fast it flows by opening and closing the trigger if the filler hole can't take the full flow. You will save a lot of time handling your oil and there won't be any mess to clean up! Our nozzle is $50.00 + $10.00 shipping. Call 1-605-881-3473 to order.